William Gleason Sensei studied Aikido from 1970 to 1980 at the main world headquarters (Hombu Dojo) in Japan and also with Yamaguchi Seigo Shihan. During that same period, Gleason Sensei studied swordsmanship (kenjutsu) as well as Japanese language, classical music, and Eastern religion. Since 1985 Gleason Sensei has continued to practice and teach under the auspices of Mitsugi Saotome Shihan and the Aikido Schools of Ueshiba. Gleason Sensei founded Shobu Aikido, Inc. in 1980 in Boston, Massachusetts, and there are presently five Shobu affiliate Dojos from the Midwest to the East Coast. His latest book is Aikido and Words of Power: The Sacred Sounds of the Kototama. 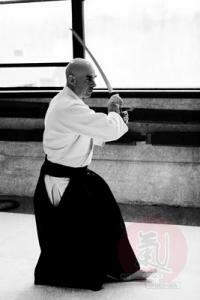 He is also the author of The Spiritual Foundations of Aikido, which has been translated into four languages. His first DVD, Aikido and Japanese Sword, shows how the movements in traditional swordwork and those in Aikido barehanded techniques are essentially one and the same. His second, William Gleason at Aikido Eastside, explores the secrets of aiki hidden within Aikido technques.